Thank you for inviting me to appear before you today to discuss the current state of the Social Security Administra tion and our plans for the future. We are grateful for your long-standing support of our programs and for providing us with additional funding for fiscal years (FYs) 2008 and 2009. Social Security is indispensable to the disabled, seniors, and survivors and is one of the most important and most successful Federal programs that our country has ever established. The programs we administer pay nearly $60 billion in benefits each month – they are an integral part of the American economy. We have a proud history of excellent service to the public, and I reiterate my promise to do everything in my power to continue that tradition. I would also like to thank you for providing us with additional funding in the American Recovery and Reinvestment Act (ARRA) of 2009 so that we can process our increasing workloads, replace our aging National Computer Center (NCC), and issue economic recovery payments. We are working with the Department of the Treasury to enable Treasury to issue the $250 one-time economic recovery payments as soon as possible. As required by law, a total of about $13.25 billion in economic recovery payments will be issued to nearly 55 million Social Security and Supplemental Security Income (SSI) beneficiaries. Although implementing the legislation requires extensive coordination with other Federal agencies, we are on track to ensure that these payments to our beneficiaries are issued in May – about 3 to 6 weeks earlier than the statute requires. Since I last testified, we published the first Agency Strategic Plan during my tenure. It outlines our strategies to meet the challenges we face and to deliver the level of service the public expects and deserves. Over the past 2 years, we have made significant progress in implementing initiatives to better serve the public and to reduce the hearings backlog. We could not have done so without your help. As a result of the funding that you provided in FY 2008, we were able to hire and train 190 administrative law judges (ALJs) and staff to support them. We are on track to hire an additional 157 ALJs and over 700 support staff this year. This additional staff will allow us to hear more cases and render more decisions. We have already seen a slight reduction in the number of cases awaiting hearings, a reduction which would have been even greater if we had not received more requests for hearing than we had anticipated. Unfortunately, but not surprisingly, we are not yet where we need to be. Despite our progress, we have significant challenges ahead. The economic downturn, combined with the retirement of the baby boomers, and the fraying of our physical and technological infrastructure have diminished our ability to address our rising workloads and backlogs. The uncertainty of our annual appropriations, which often leaves the agency without full-year funding at the start of the fiscal year, adds further complexities. Adequate and sustained funding is essential for providing high level service to the American public. Nevertheless, with your continued support, we will eliminate the hearings backlog by 2013. We administer the Nation's social insurance programs and one of the Nation's largest means-tested income maintenance programs. Each year we send benefits totaling about $700 billion to approximately 60 million persons. Social Security and SSI benefits play a significant role in the Nation's economic security. The Old-Age, Survivors, and Disability Insurance beneficiaries programs benefit workers, their dependents, and survivors at critical junctures in their lives: when they retire, when they become disabled, and when a family's wage-earner dies. Through the SSI program, we assist the most vulnerable persons in our society. These payments provide a safety net for aged, blind, and disabled adults and children who have little or no income or resources. In addition to administering our own programs, we also assist the public in applying for food stamps and Medicare, including low-income subsidies under the Medicare Prescription Drug Plan. These programs also play a significant role in the economic security of the Nation's elderly and disabled. We administer our programs and services through a network of over 1,400 offices that directly serve the public in communities throughout the country. About two-thirds of our over 60,000 employees deliver direct service to the public or support the services provided by these front-line workers. Field offices are our front door and the primary points for face-to-face contact with the public. Our employees also work in teleservice centers, card centers, processing centers, hearings offices, the Appeals Council, regional offices, and our headquarters in Baltimore . I am particularly proud of our dedicated workforce, and I am pleased that Equal Opportunity Magazine recently named Social Security the top government employer. We also received high marks from our employees in the 2008 Federal Human Capital Survey , with especially high marks for Job Satisfaction and Leadership and Knowledge Management, ranking among the top 10 Federal agencies in both categories. Recently, a leader in the customer service industry contacted one of our field offices for service. He praised the claims representative who helped him as one of the most personable, customer-oriented employees whom he had ever met, either inside or outside government. I am never surprised when I hear stories like this one; I know our employees are dedicated to our mission and to serving the public to the best of their abilities each and every day. I would like to take a few minutes to describe the demands our employees face during a typical day in one of our field offices. Our field offices are extremely busy, and our employees are pulled in a variety of directions every day. Employees have only about an hour each day before the office opens to prepare the daily schedule of appointments, attend training, read policy updates, and process pending claims and post-entitlement actions. Once the office opens to the public, employees have little time to process pending work because much of their day is spent serving visitors and processing time-sensitive actions, such as issuing immediate payments for lost checks. The two most common reasons for visiting our field offices are to file a claim for benefits or to obtain or replace a Social Security card. • About 9 percent of field office visitors file claims for benefits, including retirement, disability, survivors, spouses, and children. Field office employees give this work their highest priority. Disability claims, much more complex than retirement claims, are particularly time intensive because our employees help claimants complete detailed forms about medications, treatment, medical testing, work history, and daily activities. • About 30 percent of field office visitors seek new or replacement Social Security cards for employment or tax purposes, to replace lost or damaged cards, or to obtain State and local government benefits . This work is critical to preventing identity fraud and has become more complex and labor-intensive because of legislative changes and heightened national security. Once the office closes to the public, employees may have only a few minutes to take care of all remaining business. For example, employees often must gather additional data to verify allegations of resources and income, such as child support, unemployment benefits, or workers' compensation, in connection with the claims they had taken during the day. processed over 22 million status changes for our beneficiaries, such as changes of address and requests for direct deposit. Our other major point of contact with the public is through our 35 Teleservice Centers (TSC). The TSCs provide agent assistance to the public from 7 a.m. to 7 p.m. Eastern Time on normal business days, as well as automated telephone services 24 hours a day, 7 days a week. TSC employees handle a variety of inquiries, such as changes of address and telephone number, and requests for direct deposit and replacement Medicare cards. They schedule appointments and answer inquiries about payments and claim status and allow field offices to concentrate on workloads which require face-to-face interviews, additional development, or resolution of complex issues. 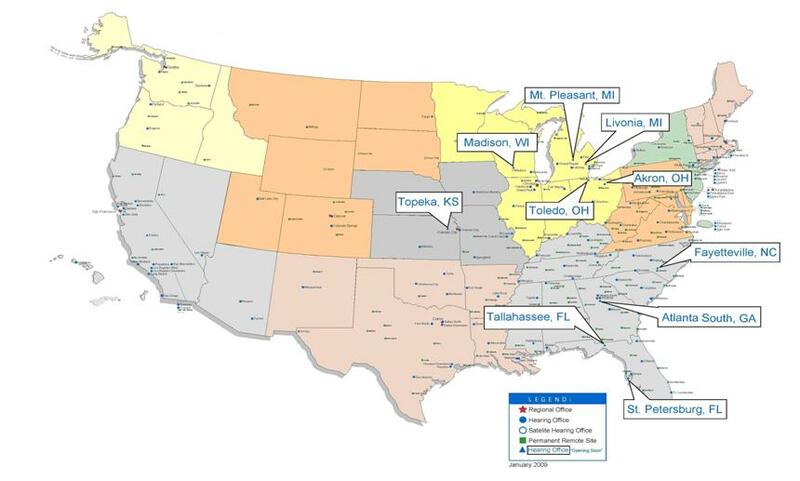 We currently have seven Social Security Card Centers located throughout the country. The card centers streamline and improve the integrity and stewardship of the Social Security number assignment process. Because of their specialized expertise, card center employees process applications for original Social Security numbers and replacement cards with a high degree of integrity, efficiency, and expertise. Applicants for a new or replacement card have shorter wait times in the card centers than in the field offices. Moreover, because the card centers handle much of the card-issuing workload, nearby field offices can focus on other critical activities, which results in quicker, more efficient service in field offices located in proximity to card centers. Our card centers are located in Brooklyn and Queens , New York ; in Las Vegas , Nevada ; in Downtown and North Phoenix , Arizona ; in Orlando , Florida ; and in Sacramento , California . Each month, we pay about $12 billion in disability benefits to more than 13 million disabled beneficiaries across the Nation. The State disability determination services (DDS), our hearings offices, and the Appeals Council are integral to processing disability claims. These components, like our field offices, struggle with workload increases while they try to drive down backlogs created by years of understaffing and inadequate resources. The disability claims process begins when a disability claimant completes an interview with a field office employee. We then forward the claim to 1 of 54 DDSs. These State agencies develop the medical evidence and make the initial determination of whether the claimant is disabled. We could not perform our disability adjudication process without the State DDS employees. A claimant who is not satisfied with the DDS's initial determination may request that the DDS reconsider it. If the claimant is dissatisfied with the reconsidered determination, he or she may request a non-adversarial hearing before an ALJ. At the hearing, the claimant may appoint a representative, testify, and call and question witnesses. (In the ten States in which the reconsideration stage has been eliminated, the claimant may request that an ALJ review the initial determination.) A claimant who is not satisfied with the ALJ's decision may request review by the Appeals Council. If the Appeals Council agrees to review a case and issues a new decision, a disabled claimant may appeal that decision to Federal district court. If the Appeals Council declines to review the decision, the ALJ's decision becomes the final administrative action, and it may then be appealed to the Federal district court. We are an agency comprised of specialized staffs, but our common goal is to provide high-quality service. We face many challenges in meeting this goal, and we plan for those we can anticipate. For example, we knew that the demographics of the baby boomer generation would affect workload volumes across the agency. We also knew that our most experienced staff could soon retire because many of them are baby boomers themselves. In fact, according to our most recent estimate, we may lose 44 percent of our current employees by 2016. We also work carefully to forecast, to the best of our ability, the effect of other workloads on the agency. For example, we could not have predicted the new non-core workloads required by legislation, such as the Medicare Modernization Act, E-Verify, or the new Children's Health Insurance Program (CHIP) verification requirements. We use the additional targeted funding provided by Congress or reimbursement from other agencies for these specific workloads. We know from recent experience that more employers are using E-Verify voluntarily, and we will update through our established process with DHS reimbursement for these activities. In addition, we are now working to accommodate States that may choose to follow new CHIP rules for benefit eligibility determinations. Certainly, we could not have predicted the current weakened state of the American economy or the high unemployment rate, factors that contribute to an increase in the number of applications for benefits. These unexpected events hit at the same time our workloads were significantly increasing due to the baby boomer retirement wave. These additional and unexpected workloads are not our only challenges. Although we fully fund the State DDSs, they operate under a myriad of State personnel and budget rules. For example, due to budget constraints this fiscal year, some States have instituted statewide staffing freezes and furloughs. Some States have excluded DDS staff from these restrictions because they recognized the negative impact such restrictions would have on their disabled residents. Other States, though, have, over our vehement objections, chosen to treat DDS employees like other State employees and subject them to State restrictions, including furloughs. Our information technology infrastructure is outmoded and inefficient, but improving dramatically. For example, we are converting the agency's master files from an in-house developed data base management system, created over 25 years ago, to a modern industry standard data base management system. We have already migrated our enumeration master file, which is our largest in terms of number of records. This year we plan to do the same with our next largest file, which houses earnings information. During the 2 years I have been Commissioner, we have also started each year without a full-year appropriation. We spent all of FY 2007, almost one-third of FY 2008, and nearly one-half of FY 2009 operating under a continuing resolution. As you well know, during continuing resolutions, we must restrict our spending levels to that of the prior year's appropriated funding. This year it meant we operated through the beginning of March with nearly $300 million less than the President's budget. Even if our workloads remained level from year to year, the annual inflation in our fixed costs, such as building maintenance, security, and salary increases, while necessary to maintain our operations, would reduce the amount we have available for taking retirement and disability claims and providing the other services the American public requires. Even with all available field office employees and managers devoted to serving visitors, waits are long – 31 percent of visitors without an appointment, about 5.8 million visitors, wait more than 30 minutes to be seen by staff; and 6 percent of visitors with appointments, about 1.1 million visitors, wait more than 30 minutes. Not only is this unacceptable to you, to the public, and to us, it is also demoralizing to our employees, who have dedicated their careers to providing outstanding service to the public. There is also a clear connection between our inability to hire staff and the deterioration in service at our TSCs. Nearly 15 percent of callers who call our 800 number receive a busy signal. As a result, many of our customers who were unable to conduct their business over our 800 number chose to go to their local field office. This increase in visitors to field offices contributed to the higher field office waiting time I have described. Moreover, we now project a dramatic increase in workloads due to the economic downturn. This increase is a cause for concern. Recent projections indicate that we will receive over 300,000 more retirement claims in FY 2009 compared to FY 2008, an increase of nearly 9 percent. The current recession has also affected our disability workloads. Studies suggest a correlation between increases in unemployment and increases in disability filings, and we have seen a sizable increase in filings so far this year. We currently anticipate more than 2.9 million disability filings in FY 2009, an increase of over 300,000 cases over FY 2008. This number represents more than a 12 percent increase in new applications and is 13 percent higher than the amount assumed in the 2009 President's budget. In addition, although it is difficult to project with precision, we believe we may receive approximately 50,000 more hearing requests in FY 2009 than in FY 2008. We also expect to receive nearly 40,000 additional requests for reconsideration and more than 20,000 requests for Appeals Council reviews in FY 2009 compared to FY 2008. We have paid the price for the growth in workloads and tight budgets in recent years. We have been forced to defer performing full medical continuing disability reviews (CDR) and other critical stewardship workloads, such as adjusting payments, correcting earnings, and processing wage reports and overpayments. We do not want to defer this work; these are critical workloads that ensure we are paying the right beneficiary the right amount at the right time. In addition, we know that for each dollar we spend performing CDRs, we recoup over $10 in program funds. However, we have had to focus our limited resources on processing our initial claims workloads and getting eligible claimants paid, at the expense of performing this important work. As a result of this workload deferral, we estimate that we had a backlog of 1.4 million full medical CDRs at the end of FY 2008, and we expect the backlog to grow by another 100,000 to 150,000 in FY 2009. 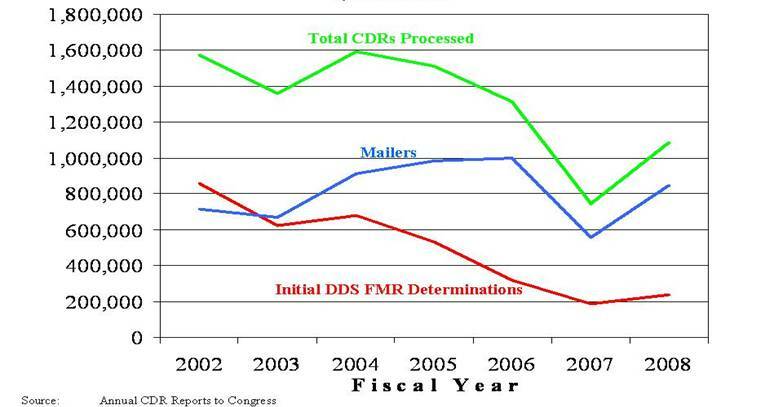 However, we expect to process significantly more CDRs in FY 2009 than in FY 2008 in large part because of the additional dedicated funding provided by Congress for FY 2009. In analyzing our challenges, our mission, and the public we serve, we have come to understand that simply working harder is not enough to overcome the workload challenges we face. Last fall, I outlined four key goals for the agency in our Strategic Plan: (1) eliminate our hearings backlog and prevent its recurrence, (2) improve the speed and quality of our disability process, (3) improve our retiree and other core services, and (4) preserve the public's trust in our programs. To move forward amidst our rising workloads, we must focus our attention on these key areas while modernizing the way we deliver service. We realize that achieving these goals will require sustained commitment and timely resources. If we are required to take on additional work, we will need sufficient funding to cover our full costs, as well as adequate time to implement any necessary regulatory, policy, process, training, or system requirements. Despite our growing challenges, we have made real progress within the past few years. We have begun the hiring and work that – if not for the economic downturn – would have produced more visible results for the American public, not just in terms of reduced backlogs and processing times, but also in terms of shortened field office wait times and fewer busy signals. Although it may not be readily apparent in these challenging times, we have achieved measurable successes. We are committed to a disability process that is fair, accurate, and as prompt as possible. Currently, though, our pending levels are too high, and claimants wait too long for a determination. Every day spent waiting for a determination creates additional burdens for many claimants who are already among the most vulnerable members of our society. This is simply unacceptable. The initiatives outlined below will modernize the disability process and improve our timeliness, accuracy, and efficiency. We must improve the beginning of the administrative process, even before a hearing is requested. Using new rules and technology, we can allow claims earlier in the process and improve service for disability claimants. I am pleased to report today that at the DDS level, we have reduced processing times by about 4 percent in 2007 and in 2008. We are currently using two processes – the Quick Disability Determination (QDD) process and Compassionate Allowances – to fast-track about 4 percent of all disability cases, a significant increase from the 2.6 percent of cases fast-tracked last year. This year we will find 100,000 to 125,000 Americans with the most severe disabilities eligible for benefits in about 10 days, instead of the 3 to 4 months it typically takes for an initial determination. Under QDD, a predictive computer model analyzes specific data within the electronic file. This model identifies cases with a high potential that a claimant is disabled and medical evidence is readily available. Through Compassionate Allowances, the model identifies claims for applicants with medical conditions so severe that their conditions by definition meet the required standard. These fast-track systems increase the efficiency of the disability process and free up resources. We have expanded our efforts to revise and update the medical listings. These listings allow us to make a favorable determination or decision for certain claimants without the need to consider that person's age, education, or work experience. When I became Commissioner, the medical listings had not been updated for decades. Some listings had last been updated in the 1970s, others in the 1980s. That is far too long. So, in the last 2 years, we have published final regulations for 3 of the 14 adult body systems, so they now reflect the updated advancements in medicine and technology. We are on schedule to update all of our medical listings every 5 years, and, in the future, we plan to update these listings as often as every 3 years. We are also in the process of expanding the listings to include rare diseases and conditions that clearly represent permanently disabling conditions. We are always looking for ways to use technology to improve our disability process. For example, we are on the forefront of the move to electronic health records and are primed to take advantage of the new and exciting possibilities related to health information technology (HIT). We began working with Beth Israel Deaconess Medical Center (BIDMC) in Boston last spring to determine how we could use HIT to make our disability decision-making more efficient and timely. Currently, when a claimant treated at BIDMC files a disability application, the Medical Evidence Gathering and Analysis through Health Information Technology (MEGAHIT) system automatically sends an electronic request for his or her patient's medical records. Almost immediately, the hospital electronically transmits back to us the individual's medical record through MEGAHIT. We receive these records in seconds and minutes, rather than the usual weeks and months. As part of our HIT initiatives, we are a leader in the development of the Nationwide Health Information Network (NHIN), the nation's electronic network of health information. On February 28, we took part in the first exchange of data across the NHIN as the health care provider MedVirginia forwarded records to us in connection with a disability claim. We will be tracking the flow of data from MedVirginia providers to us by way of the new system. This initiative will revolutionize the way we process disability claims by allowing us to automatically request and receive the medical records needed to make disability determinations. Yet we realize that this is a time of the great change in the HIT area and thus we remain committed to participation in the standards and certification process, as well as to the protection of the privacy of these records. We also continue to develop and improve our Electronic Case Analysis Tool (eCAT). This tool helps disability adjudicators work through the policy aspects of claims adjudication to yield consistent, policy-compliant outcomes and better service to claimants. We expect the use of eCat will produce well-reasoned determinations with easy-to-understand explanations of how we reached our decision. We plan to develop and implement a common case processing system for the DDSs. Currently, each of the 54 DDSs has its own unique processing system. A common system will help us take advantage of rapidly changing health care industry technology and provide the foundation for a seamless electronic disability case processing system. Our DDS partners agree that we need a common system, and we are working closely with them to develop requirements. This essential improvement will modernize and streamline our disability process, and we can only make important improvements on a timely basis, such as eCat, if we have a common system. As I have said many times, eliminating the hearings backlog is a moral imperative. Despite the additional workloads caused by the economic downturn, we have adjusted to changed circumstances and are still on track to eliminate the hearings backlog by 2013. Although it is difficult to project with precision, we believe we may receive approximately 50,000 more hearing requests in FY 2009 than in FY 2008. We have already taken preparatory actions in anticipation of this surge in hearing requests. We have moved to improve our processes, add new staff, and utilize new technologies. Through the hard work of our employees and with the support of Congress, we are making positive strides toward driving down the hearing backlog and providing Americans with disabilities the prompt service they deserve. In fact, we have already seen a slight reduction in pending hearing cases. These cases have dropped in the past two months. Furthermore, in the spirit of the President's directive for transparent government, we will post the backlog numbers on the internet quarterly along with a clear explanation about the hearing backlog. increasing efficiency with automation and improved business processes. Earlier, I discussed our initiative to fast-track initial cases. I will now highlight some of the key components of the plan's other three elements. We remain committed to improving our hearing office procedures. We have significantly reduced the inventory of the most aged cases, those that have been pending the longest. Clearing these cases normalizes our hearing work flow and more importantly, claimants who have waited far too long for a hearing decision finally receive one. We defined aged cases in FY 2008 as those cases that would be at least 900 days old by the end of that fiscal year and cleared all but 281 of the more than 135,000 we identified. For FY 2009, we raised the bar and redefined aged cases as those cases which will be at least 850 days old by the end of this fiscal year. There were 166,838 aged cases at the beginning of FY 2009, and we are ahead of our target and are more than halfway toward clearing all of them. We are looking to continue to attack the aged cases, and our probable goal for FY 2010 is to work the 825-day-old cases, approximately 179,000 cases. We are also finding ways to expedite favorable decisions. We reinstituted the Attorney Adjudicator program to allow our most experienced attorneys in appropriate cases to make on-the-record, favorable decisions without a hearing. This program brings eligible applicants onto the disability rolls more quickly than if they had to wait for a hearing. Through the first five months of FY 2009, Attorney Adjudicators had issued 13,462 favorable decisions and are on target to meet our year end goal. We have also instituted a DDS remand process, special Federal Quality Reviewer screening units, and a Medical Expert Screening process to help identify cases that may be allowed without the need for a hearing. We are working to maximize our ability to issue decisions at any given point in the disability process. In collaboration with State DDSs, we are using the informal remand process to send pending cases, which have been profiled as likely to be allowed, back to the DDS for review and possible favorable determination. As a result of this initiative, we were able to dismiss 16,838 requests for hearing due to favorable DDS decisions in FY 2008. We are on target to meet our year-end goal for DDS remands. All States are now able to process electronic informal remands, which will enable us to more easily transfer these cases to the DDSs. Our first National Hearing Center (NHC) is performing well. Located in Falls Church , Virginia , the NHC plays a crucial role in increasing our adjudicatory capacity and giving us the flexibility to address the areas of highest pending without waiting years to build or expand hearing offices. For example, transferring cases to the NHC from some of the offices with the highest number of pending cases has contributed to an improved average processing time in the hearing offices in Atlanta , Georgia ; Cleveland , Ohio ; and Flint , Michigan . The ALJs in the NHC hold hearings remotely using video conferencing and provides us the flexibility to better balance pending workloads across the country. In FY 2008, t he NHC issued 2,151 decisions. We will open another NHC site in Albuquerque , New Mexico this month and plan to open one in Chicago in the upcoming months. We also plan to open a site in Baltimore early next fiscal year. We are also working with the General Services Administration (GSA) to expedite opening 10 new hearing offices. (See Appendix B for a map of the planned hearings offices.) We are adding centralized centers for case pulling and decision writing in the regional offices to more quickly accommodate our needs. We are also hiring new employees. In FY 2008, we hired and trained 190 ALJs. We have received a new certificate of eligible ALJ candidates, and we expect to hire 157 new ALJs this year. We have already hired 140 new support staff in our hearing offices so far this year, and expect to hire over 700 additional support staff. This hiring will allow us to achieve a national average ratio of about 4.5 support staff to every ALJ. We are on target to eliminate the hearings backlog by 2013. We expect to reduce the number of pending hearings to 466,000 by FY 2013, which is the number of cases we will have when we reach our goal of an average processing time of 270 days. We are focused on hiring enough ALJs and support staff to achieve these goals given our current receipt and productivity projections. Our current estimate is that we will need 1,400 to 1,450 ALJs to achieve our goals, and we are expanding our physical infrastructure, to the extent we can, so that we can reach that level. We expect to hire 208 ALJs in FY 2010, while maintaining a national average ratio of about 4.5 support staff per ALJ. We will continue to work with GSA Headquarters and the Regional GSA offices to ensure we have adequate space to handle this significant increase. Finally, we are seeking to increase our adjudicatory capacity by ensuring that our ALJs are providing the service the public deserves. At the beginning of FY 2008, our Chief ALJ issued a letter asking all ALJs to strive to issue 500 to 700 legally sufficient decisions a year. About 50 percent of full-time experienced ALJs are meeting this expectation. Productivity in our Office of Disability Adjudication and Review (ODAR) increased substantially for two consecutive years, in FY 2007 and FY 2008. In FY 2008, ODAR conducted nearly 15,000 more hearings than in FY 2007; average dispositions per ALJ also increased. But we were not able to sustain that level in the first few months of FY 2009 due, in part, to the hiring and training of a large number of new ALJs late in FY 2008. It takes about 2 years to fully train and mentor newly hired ALJs and support staff. Thus, we expect these new judges to become increasingly productive throughout the year, and we have already seen a significant improvement in productivity in both January and February. The increase in adjudicatory capacity at the hearing level will generate increased workloads at the Appeals Council. To address this rising workload, we will hire additional administrative appeals judges and support staff for the Appeals Council, and make additional overtime available. In FY 2009, we expect to add a total of 135 new staff at the Appeals Council, while replacing losses due to attrition. We have also taken steps to “work smarter.” In FY 2008, we made significant progress in eliminating the remaining backlog of paper folders and transitioning to an electronic environment. We are preparing more cases for hearing (“pulling cases”) this year. This increase in cases ready for hearing will give the ALJs more cases to hear and decide. We are expanding the use of video equipment and have initiated the Representative Video Project. Under this project, representatives of disability claimants may use their personal equipment to participate in hearings from their own offices. We are using desktop video units in claimant-only hearing sites in addition to the traditional video equipment used in hearing offices. We will be implementing an in-line quality review of the claim file, scheduling process, and decision writing to ensure timely and legally sufficient hearings and decisions. To balance pending workloads nationally, last fiscal year we realigned service areas and moved workloads from regions with heavy workloads to regions that had the capacity to process additional work. We continue to monitor our workload numbers and make additional adjustments as needed. Our plan is working – we have improved our hearing level performance. In FY 2008, we had an impressive 5 percent increase in our hearing dispositions and made important gains in reducing aged cases and average processing times in the most backlogged offices. But for the increase in filings due to the economic downturn, the number of pending cases would have dropped for the first time this decade. However, because of the increased workloads, we ended up with a 14,000 case increase in pending cases. Yet, this is well below the annual increase of 70,000 cases we have seen in the years preceding the hearing backlog reduction plan. So far in 2009, our pending level rose in first 3 months, but dropped by 1,294 cases in January and by another 1,719 cases in February. Our pending level is currently up 4,700 cases over the level at the end of FY 2008. If we continue our present concerted effort, combined with the increased productivity of our recently hired judges, I am hopeful we can drive the hearings backlog downward this fiscal year. We have a unique opportunity to significantly improve our service to our disability claimants. Taken together, our initiatives address every aspect of the hearings backlog problem. If all of these initiatives are successful, there is light at the end of the tunnel. We simplified our policies, improved our technology, and automated business processes to deal with our other significant workloads. As the Government Accountability Office recently indicated in its January 2009 report on service delivery and the baby boomer retirement wave, our agency's service delivery has suffered because funding has not kept up with increasing workloads. The only way we have managed to hold our own is by offering the public the option of secure, user-friendly, electronic services. Perhaps the most dynamic and successful model illustrating how we plan to improve service in the future is our Ready Retirement project. In FY 2008, we began putting the key features of this transformational initiative into place by simplifying and further automating the processing of online retirement applications. We will continue to implement this initiative over the next few years using a multi-faceted approach: simplified enrollment, streamlined adjudication, and public education. The first key feature of Ready Retirement focuses on simplified enrollment. In December 2008, we introduced a new Internet application (iClaim) for retirement, disability, and aged spouses benefits. The new online claims application asks claimants questions that are pertinent to their own personal situation, relies on information already housed within our records, and contains navigational tools that make the application easy to use. As a result, iClaim not only simplifies the current process, but also shortens the time it takes to file online and eliminates the need for most online filers to visit their local field office. We have had incredible success with our launch of the iClaim media campaign featuring our spokesperson Patty Duke. The simplified enrollment process also hinges on efforts to update our policy. After thorough study, analysis, and vetting with agency components, we have simplified a number of policies that support Ready Retirement and other online initiatives. Future releases of iClaim will include authentication protocols to provide two-way online communication with online applicants while safeguarding personally identifiable information. We also are exploring new data exchanges and matching agreements to verify claims information online. Our efforts to streamline policy apply to both online claims and claims filed in person. For example, we know there have been concerns about our policy on advising claimants about their options for electing when to start receiving benefits. Our policy instructs employees to discuss all benefit types for which a claimant may be eligible, including options for when to start receiving benefits and does not prohibit employees from advising claimants about their benefit election options. The same policy holds true for Internet claims: claimants who file online have access to agency publications that explain all factors that they should consider when deciding when to retire; these publications also explain what other types of benefits are available to the claimants. Employees processing these online applications screen for other potential entitlements and contact claimants to discuss these and month of election options if there are questions. Our current version of iClaim, which is similar to our prior Internet application, currently requires manual review and adjudication because it does not take into account certain factors, such as non-service months, protective filing, and retroactivity when presenting month of election options to claimants. I am excited to announce that in May 2009, we are introducing a new version of iClaim that will offer election options to claimants filing online based on all of these factors. This new version of iClaim will give online filers additional support and will reduce the need for employees to contact them. Our employees will continue to contact claimants as necessary to ensure that their benefit elections are clear and that accurate determinations are made. The second key feature of Ready Retirement is streamlined adjudication. The claims adjudication process includes many determinations, and the streamlined adjudication model is the next step in automating some of these manual decisions. All retirement applications require some manual processing, but streamlined adjudication will automate parts of the process. This automation will provide valuable efficiencies and administrative savings, while increasing our ability to provide a fully electronic claims process to the public. Improvement in adjudication will be implemented only after there are safeguards in place to protect applicants' rights to all the benefits to which they may be entitled. Finally, the last key feature, and really the foundation, of Ready Retirement is public education. Through our financial literacy campaign, we are educating the public about making an informed decision as to when to begin receiving retirement benefits. In the past year, we implemented several educational tools. We introduced an online Retirement Estimator to enable the public to get immediate and personalized benefit estimates, and we created a new fact sheet and accompanying podcast titled, “When to Start Receiving Retirement Benefits.” We also revised the Social Security Statement to provide more information to younger workers. For every Statement sent to a worker aged 25-35, we now include an insert called “What young workers should know about Social Security and saving.” This new supplement provides additional information about retirement planning and includes a chart showing how much difference just a little bit of saving can make. Our Internet services took top honors on the American Customer Satisfaction Index (ACSI) scorecard for the fourth quarter of FY 2008. The ACSI tracks trends in customer satisfaction and allows Federal agencies to benchmark their performance against comparable best-in-class entities. Our Retirement Estimator and iClaim applications were the highest scoring applications in the ACSI's “top performers” category. The public has responded enthusiastically to the new iClaim process. So far this year about 33 percent of our retirement applications have been filed online, up from only 10 percent just 2 years ago. Taken at face value, this increase alone is impressive. But to truly understand the importance of Ready Retirement for our field operations, let me explain to you what just one aspect of service in the field would look like today if Ready Retirement did not exist. In the first quarter of FY 2009, 161,000 applicants started their retirement applications online. Without Ready Retirement, those claimants would have visited their local field offices or filed by telephone. If all of these claimants had filed in their local field office, we estimate wait times would have increased by 5 percent and busy signals by 6 percent. We will continue to analyze customer satisfaction and the performance and usability of iClaim. It is more critical now than ever that we are able to continue to fund this important project. As I mentioned earlier, recent projections show that we now expect to receive over 300,000 more retirement claims in FY 2009 compared to FY 2008. We must, to the greatest extent possible, push forward with our efforts to automate these applications. If our Ready Retirement initiatives are successful, we will not only be able to more efficiently and effectively handle the increase in applications from both baby boomers and the economic downturn, but also we will be able to expand these new processes to automate and streamline other high volume workloads. We are proud of all of our recent accomplishments, and I expect our momentum will continue. The additional funding in the ARRA together with our FY 2009 appropriation puts us in a much better position to deal with our fraying infrastructure and the current service challenges created by the economic downturn . Our NCC houses data critical to providing outstanding service and to paying benefits promptly and accurately. Because the NCC is over 30 years old, it will soon no longer be capable of supporting the growing demands of our computer systems and computer-based services. Replacing the NCC will allow us to provide service 24/7 and avoid outages and slowdowns that disrupt service delivery. Now that we have the ARRA funding, we are continuing to work closely with the GSA – which manages federal construction projects – on all aspects of the pre-planning for the new NCC. The formal planning process with GSA will include formulating criteria for the new data center, selecting a site, and developing a detailed construction timeline. In consultation with us, GSA will be responsible for completing most of these steps. The ARRA also calls for a one-time payment of $250 to certain Federal beneficiaries, including Social Security and SSI beneficiaries and provides the administrative funding necessary to ensure that these critically needed payments are infused into the economy as quickly as possible. We are on track to make these payments in May, ahead of the statutory deadline. The ARRA also provides an additional $500 million to process our rising retirement and disability workloads, as well as the backlogs resulting from the economic downturn, and to invest in related information technology projects. Unlike annual appropriations, which must be used within a fiscal year, we will be able to use this $500 million over the next 18 months. We are handling workloads far above what we anticipated just 6 months ago. Our full year appropriation, which supplies $126.5 million more than was included in President's FY 2009 budget, as well as the additional funding in the ARRA, will allow us to invest in information technology, to hire 5,000 to 6,000 new employees before the end of the year, and to allot additional overtime to process critical workloads. In addition to replacing all of our losses in FY 2009, we will assign new employees to our front-line operations where they will have the greatest impact – approximately 1,200 employees to our field offices, 900 employees to our hearings offices, and 600 employees to State DDSs. Unfortunately, our new employees will not have an immediate impact on our current or backlogged workloads as hiring and fully training new employees is a lengthy and resource-intensive process. Hiring requires posting vacancies, reviewing applications and resumes, conducting interviews, conducting background checks, and offering positions. Often, new employees must relocate to their duty stations or give their employers sufficient notice so that they can seek a replacement. Once they report to work, training lasts from 13 to 17 weeks because of the complexity of our programs. After this initial training, new employees are assigned a mentor to act as a resource and to assist in learning the intricacies of processing our work. This “on-the-job” training for new employees typically lasts a full year. At the end of the year, though not fully proficient in all parts of the job, these employees would be making a significant contribution to workload processing. The time spent mentoring, however, reduces the time our more experienced employees have to process their own work. When we have significant increases in staffing levels, the time put into training and mentoring result in reductions in productivity in the short run. We made a commitment to the American public to work down the hearings backlog. We continue to improve productivity each year and to process more work. In FY 2009, we plan to process over 300,000 more retirement claims, 30,000 more initial disability claims, and approximately 70,000 more hearings than in FY 2008. The additional funding will also help us handle increasing visits to our field offices and calls to our 800-number. The FY 2010 President's budget proposes an increase of 10 percent above the FY 2009 level. This amount includes resources to increase our staffing levels in FY 2010, which will enable us to further increase our productivity. Preserving the public's trust in our programs is one of the key aspects of our Agency Strategic Plan. We take pride in our ability to protect and carefully manage the resources, assets, and programs entrusted to us. We must ensure that we pay beneficiaries the correct amount of benefits and that they continue to be entitled to those benefits. Due to the budget constraints and increasing workloads, however, we have been forced in recent years to scale back these program integrity efforts. Our primary program integrity tools are CDRs and redeterminations of income and resources in the means-tested SSI program. The FY 2010 President's Budget includes $759 million for our program integrity efforts, an increase of $255 million from FY 2009. This will allow us to complete a total of 794,000 CDRs, of which 329,000 will be full medical CDRs, and 2,322,000 SSI redeterminations. This funding will ensure that taxpayer dollars are being spent properly in the major entitlement programs. We conduct work and medical CDRs to determine whether or not beneficiaries continue to meet the definition of disability. We initiate CDRs based on work activity when a beneficiary voluntarily reports that he or she is working, when wages are posted to a beneficiary's earnings record, or when a beneficiary has completed a trial work period. In FY 2008, we conducted about 170,000 work CDRs, which resulted in cessation determinations in 850 cases. Generally, the law requires us to conduct medical CDRs on a periodic basis to ensure that only those who continue to be disabled receive benefits. We conduct medical CDRs using one of two methods. We periodically review cases when we expect that a beneficiary's condition will improve, and we have a DDS perform a full medical review. We also conduct medical reviews when we receive voluntary or third-party reports of medical improvement. In some cases, we send questionnaires to beneficiaries, whom we have identified using a statistical model, and evaluate their responses to determine if they remain disabled. In FY 2007, we began using a new statistical model to select cases with a higher likelihood of medical improvement. That year, we processed 747,170 periodic medical CDRs of which 189,955 required full medical reviews. We spent $281 million to process these CDRs. Of the CDRs processed, we notified 52,490 beneficiaries that we would be ceasing their benefits because they no longer met our definition of disability. We estimate that, after all appeals are exhausted, we will stop paying benefits to about 36,000 beneficiaries, along with their eligible dependents. We estimate that the present value of future benefits saved from this activity is $3.3 billion. Historically, the ratio of program savings to administrative costs for these cases is about $10 to $1. Fluctuations in the year-to-year savings-to-cost ratio may occur, however, due to changes in the distribution of CDRs processed under the disability or SSI programs and the percentage of cases where there is a high likelihood of medical improvement. In FY 2008, we processed 240,000 full medical CDRs, an increase of about 50,000 over FY 2007. The FY 2009 Omnibus Appropriations Act provides an upward adjustment to the discretionary caps to fund program integrity activities such as CDRs. At this level, we will be able to process 329,000 full medical CDRs this year, an increase of 89,000 compared to FY 2008. Despite these increases, at the end of FY 2008, we had a backlog of 1.4 million full medical CDRs, and we project the backlog to grow by another 100,000 to 150,000 in FY 2009. We must also ensure that we pay SSI in the correct amounts. Due to the complexity of the SSI program and the large number of factors that can affect a recipient's eligibility and payment amount, these redeterminations can be particularly challenging. One of the ways we ensure accurate payments is by periodically completing redeterminations to review all the non-medical factors including income, resources, and living arrangements of SSI eligibility, such as resource and income levels and living arrangements. Based on this review, we determine whether a recipient is still eligible and still receiving the correct payment amount. There are two types of redeterminations: scheduled and unscheduled. Except for certain institutionalized recipients, we periodically schedule all recipients for a redetermination at least once every 6 years. Moreover, using a statistical model to estimate the likelihood of overpaying SSI recipients, we target the most error-prone cases each year. We conduct unscheduled redeterminations on an as needed basis when recipients report, or we discover, certain changes in circumstances that may affect the SSI payment amount. In FY 2008, we conducted 1.221 million SSI redeterminations. We estimate that these redeterminations will produce $2.1 billion in retroactive payment recoveries and ongoing payment reductions. If we had the resources to conduct SSI redeterminations on all SSI recipients, approximately $5.7 billion in recoveries and ongoing payment reductions would accrue. In FY 2009, we expect to conduct 1.7 million SSI redeterminations, an increase of nearly 500,000 compared to last year. In short, we know our program integrity workloads are critical to ensuring well-run programs and accurate payments, but our ability to carryout such workloads depends upon resources including the availability of trained staff to do this work. With the additional funding we are receiving in FY 2009, we will perform more CDRs and SSI redeterminations. For FY 2009, we plan to process 329,000 medical CDRs and 1.711 million SSI redeterminations, an increase of 89,000 and 490,000, respectively, from FY 2008 levels. Even with these increases, we still processed fewer program integrity reviews than we did earlier in this decade. Due to the tight budgets of the recent past, we had to make tough choices between service to the public and stewardship efforts. We believe that we are beginning to reverse the overall decline in program integrity reviews, and we expect further increases in FY 2010 because of the funding included in the President's FY 2010 budget proposal. To keep pace, we know we have to modernize the way we do business, and we are making great strides to do so. We are searching for additional policies we can streamline, technologies that we can introduce or improve, and business processes that we can restructure or automate. Below are some of the innovations that we plan for the future. Without sufficient and timely funding, some of these innovations may be difficult to implement. Historically, our systems were developed at different times to meet a specific need that arose. This reactive process resulted in a collection of technologies rather than a cohesive, fully integrated system. Our current strategy introduces seamless Service Oriented Architecture (SOA) to replace our aging online and in-office benefit applications. We will build our information services so that the core data and components can be shared rather than duplicated in many different systems. Without the need to consider multiple stove-piped systems, systems development of new business processes under SOA will be more efficient. Although still in the planning stages, the Disability Direct initiative will automate the processing of online disability claims resulting in a much more efficient route from application to payment. It will improve the online disability claim and appeals process by collecting information once and re-using it rather than requiring applicants to complete the same information repeatedly, which will help offset our labor-intensive disability workload. This streamlined process will provide more time for employees to handle other workloads and help with field office and telephone traffic. It will also fulfill the public's expectation of convenient, effective, and secure electronic service delivery options. We are developing strategies and an implementation plan for reducing Social Security number related workloads so that we can improve service to the public while maintaining the integrity of the SSN. The goal of the Quick, Simple, and Safe SSN initiative is to find new ways to assign SSNs, update SSN information, and issue replacement Social Security cards using efficient and secure methods. In addition to the seven current Social Security Card Centers, we plan to open four additional centers: two in Houston , Texas , one in Minneapolis/St. Paul, Minnesota , and one in Philadelphia , Pennsylvania . We handle over 57 million calls on our national 800 number each year. The underlying telephone system structure is antiquated so we must make infrastructure improvements to ensure that our telephone service is convenient, accessible, and efficient. Over the next several years, we are replacing nearly all of our phone systems with Voice-over Internet Protocol (VoIP) technology. A project of this scope is initially costly, and we have moved cautiously so that we can address concerns that inherently arise with any new system. We believe the end result will improve customer service and lower long-term costs. VoIP gives us flexibility to route calls from busy sites to less busy sites when necessary. We also will be able to collect management information that will allow us to identify and make adjustments to improve service including some customization like language preference that may be prevalent in certain geographic locations. We plan to continue to add automated applications that are responsive to the public's needs. Callers who use our automated services can conduct a variety of transactions as well as listen to a variety of informational messages addressing frequently asked questions. Improving our telephone operations will allow callers the convenience they want while freeing us to work more complex workloads. After visiting several field offices, in January 2008, I asked my staff to examine our field office layouts and develop ways to improve field office reception areas so they are more efficient for conducting business. The ultimate goal of this initiative, known as Space Modernization and Reception Transformation Service (SMART Service), is to lay the groundwork for the “SSA Office of the Future.” In our field offices, we are currently piloting new technology that allows us to deliver service to rural areas through video, the public people about interacting with our agency by watching a Social Security satellite broadcast, and providing self-help computers to visitors who want to do business over the Internet with us but many not have access to a computer at home. Next year, our agency will celebrate its 75th anniversary of providing critical services to nearly every American. Over the last three-quarters of a century, our programs and responsibilities have continued to expand. Unfortunately, for too many years, we have not received sufficient and timely funding to allow us to keep pace with our increased workloads. You have started to change that pattern. Therefore, once again I want to acknowledge our appreciation for the funding you provided for FY 2008 and 2009 and in the ARRA. We will continue to use this money to reduce our backlogs by hiring and training new employees and expanding our use of technology. We will also protect the information we house and maintain the services we provide by building a much-needed new National Computer Center . Of course, we will work with Treasury to issue the $250 one-time economic recovery payments sooner than required. I am acutely aware that our Nation is in economic crisis, and we take the responsibility associated with the Administration's and your investment in our agency seriously. With your support, I am confident that we can successfully address our challenges, but it will take several years. I am compelled to stress that we will continue to need timely, adequate, and sustained funding beyond FY 2009. Last year, I testified that we were facing an avalanche of retirement and disability claims at the same time we were addressing large backlogs due to years of increasing workloads and limited resources. That situation has been exacerbated by the economic downturn and we are experiencing an increase of applications over what we projected. We did as much as we could to be ready to act when we received our budget. We are currently hiring thousands of new employees who we will need to train. Many of them will not become proficient this fiscal year delaying the positive effect they will have on our workloads. Our greatest opportunity for success is directly tied to timely and sustained funding. We are committed to working with Congress and the American people to address our challenges and improve service for the years ahead. We are confident that with your support, the support of our stakeholders, and the necessary resources, we can achieve our goals.